This blog contains thoughts that might be helpful for anyone struggling with an addiction. If these thoughts make sense please leave an anonymous comment or two. “If you always do what you’ve always done, you’ll always get what you always got.” For years I have been fascinated with entrepreneurs and inventions. Many entrepreneurs don’t think the way most people do. They think of improvements and ways to change processes or products to facilitate increased efficiency, cost savings, or ease of use. I find this fascinating because when I see a new invention, I think: “that’s genius! Why didn’t I think of that? It was right there, under my nose, all along.” I have always gotten stuck in the rut of “this is how it has always been done and there is no other way to do it.” Over the past few years, going to Italy as a missionary and to China for a business trip, I recognize that people accomplish the same goals through entirely different means, and it works out for them! In some cases, others even find better ways to do things that I thought could not be improved. It can be so easy to get stuck in this rut of thinking, especially as an addict. Behavioral processes and patterns become so consistent and common that they can literally become hardwired into the makeup of one’s brain. 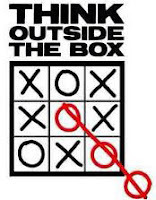 One thing that has helped me to break the cycle of addiction is to think “outside the box.” An example of this “outside the box” thinking was a lightbulb moment my freshman year of college. I went to the bishop to confess acting out, just like I had done with every other bishop before. He asked what happened. I told him that I was feeling really triggered, I had to take a shower, and I acted out while taking a shower. He stopped me and said: “you don’t have to take a shower.” I was really confused. I responded: “I don’t have to take a shower? Yes I do! Showers are important. I need to be clean.” He took a different angle. “Would it be the end of the world if you didn’t shower?” “Well, no.” I responded. “Are you going to go to Hell if you don’t take a shower?” “Uhhh….I don’t think so?” I replied. This news that I didn’t have to shower had me practically rethinking everything I thought to be true. That was such a lightbulb moment for me. I DON’T HAVE TO SHOWER!! What a mind-blowing idea. As I have reflected on this fact over the years, I have seen how I facilitate and justify my acting out in addiction by telling myself “but I have to do this….” I have seen this pattern over and over. It goes something like this: “I’m feeling so tempted right now. Taking a shower is probably not a good idea. But I HAVE to. I’ll probably smell if I don’t.” Or “I’m feeling really tempted right now and getting on the internet is probably not the smartest idea…but I HAVE to get my homework done tonight by midnight or else it will be late.” The truth is, we don’t HAVE to do anything. By buying into the idea that we HAVE to do something, is buying into Satan’s lie that he tried to deceive us with since the beginning of time. Satan’s plan that opposed the Plan of Salvation was probably called “The You Have to Plan.” You will be forced to be perfect so that everyone can return and live with God. Well. That plan wasn’t chosen because making people “HAVE” to do something gives our agency over to Satan and turns us into “objects” to be acted upon and not “agents” to act for ourselves (2 Nephi 2:26). Sound familiar? Ever been in a place where you felt like you “HAVE” to do something like homework that kept you up late or research online that always ended up in relapse? Telling ourselves that we “HAVE” to go into an environment that is threatening our sobriety not only sedates our conscience (or lulls us into carnal security) and provides an abundance of excuses for after we relapse, but it also hands the reins of agency over to Satan. As we all know, “the devil cheateth [our] souls and leadeth [us] away carefully down to hell” (2 Nephi 28:21). Getting stuck in the trap of “I HAVE TO” is dangerous because “If you always think what you’ve always thought, you’ll always get what you always got.” Let’s resolve today to be a bit more like our entrepreneur friends and think outside the I-HAVE-to-do-it-this-way box. The reason this is such a powerful paradigm shift is because thinking outside the box is effectively taking the reins back from Satan and using our powerful gift of agency to choose an alternate ending to the oh so common “slippery slope” of relapse. * This post was written by my good friend Tyler, who inspires me every day with his wisdom.